Red Hair Styles Colour dye advice, news smart beauty. Our Red Hair Styles Colour range covers a broad range of red hair colours. These are our current great value red hair best sellers. Be bold and design your own style with salon results. Get Intense Red highlights from our home kit and inject some colour into your summer! With this complete kit you can easily create professional salon fine or chunky highlights. We will also show you how to create other colouring techniques such as flashes, slices, tips and under-colouring. This product is suitable for natural or pre-coloured, Afro-Caribbean, Asian, European and Japanese hair. You get brilliant colour in just 30 minutes, simply follow the step-by-step instructions provided. 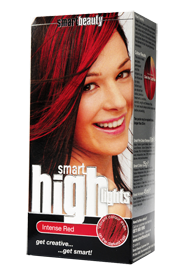 Make a fashion statement using this bright and bold semi-permanent product from the Smart Beauty Colour Collection. Create bold, high-fashion looks with rich colour that lasts, using our simple home colouring kits that deliver dramatic results, you can be the one to set trends.